I’m writing on the blog today to let you know I’m not writing on the blog today. How’s that for a riddle? People keep blogs for all sorts of reasons. This blog here? I’m going to journal my next 30-, 60-, and 90- days, my next six months, and all the months I’ll need to make it as a writer. When you think about it, because I have a blog and a few writing clients, I’m already, technically, a writer. But you and I both know what I mean. I mean, I’m not yet a guy sitting in a coffee shop in Key West, plunking away on my Macbook secretly “making a living” writing articles for my clients, chapters for my next book, and asking other speakers, celebrities, and personalities if I can’t also write for them. It’s going to happen. My journey started Saturday morning after meeting with the way-smart D.J. Its’ funny …well, sad, actually …that he spelled it out so perfectly. I’m the only one who doesn’t believe in me. Also, I’ve kept a journal off and on since I was in high school. I usually used a typical spiral notebook or a composition journal, even though I knew Moleskins were the true, artsy, gold-standard. 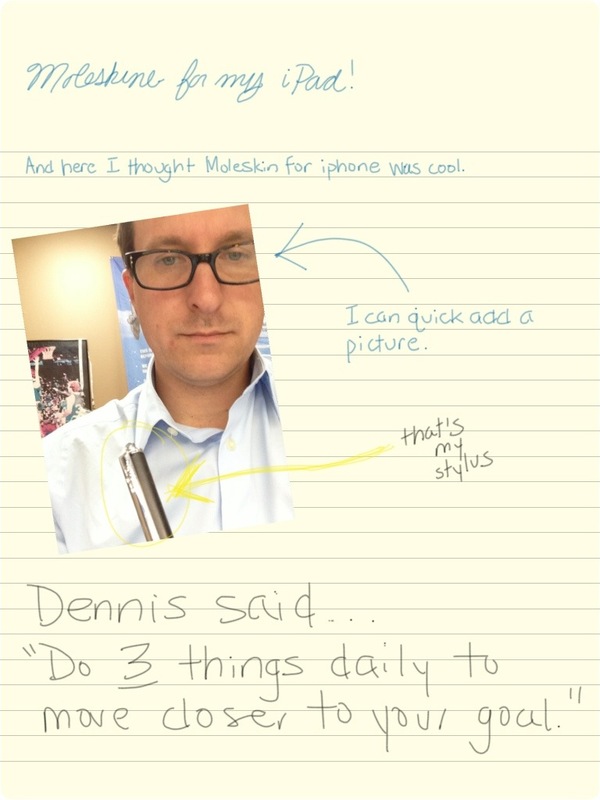 Lo and behold, Moleskin has a free app for iPad (and iPhone) and its brilliant and makes me feel snobby. I love it.